These ductless split-type air conditioner systems have outdoor and indoor components. A mini-split system typically supplies air conditioned and heated air to a single or a few rooms of a building. 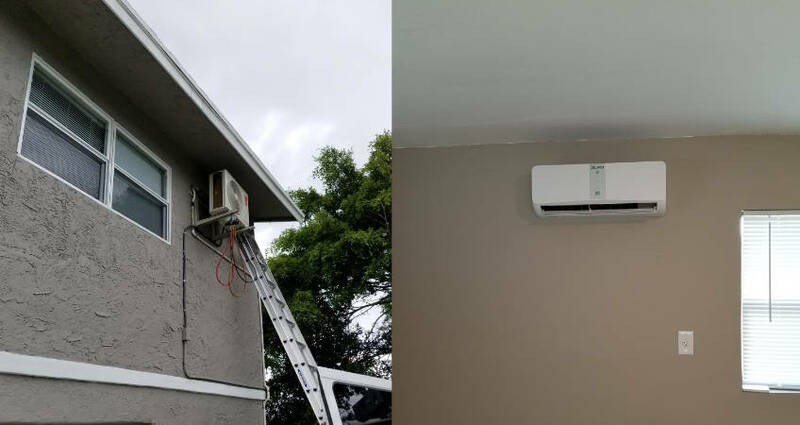 Multi-zone systems are a common application of ductless systems and allow up to 8 rooms (zones) to be conditioned from a single outdoor unit. Multi-zone systems typically offer a variety of indoor unit styles including wall-mounted, ceiling-mounted, ceiling recessed, and horizontal ducted. Mini-split systems typically produce 9,000 to 36,000 Btu (9,500–38,000 kJ) per hour of cooling. Multi-zone systems provide extended cooling and heating capacity up to 60,000 Btu’s. Contact us today to request your mini split system installation appointment.